Well, more, to come—since it's really just a scant 6 inches now. And it looks prettier with ever round! I couldn't be happier with the results! So far no massive pools. or any sort of noticeable spiral pattern. There are small splotches of color--but that's OK. I've decreased-- (10 chevrons/originally 17 stitches in each repeat—now down to 12 in each repeat(120 stitches total)) to give it some shape. Now I am ready to change pattern—to a soft rib. 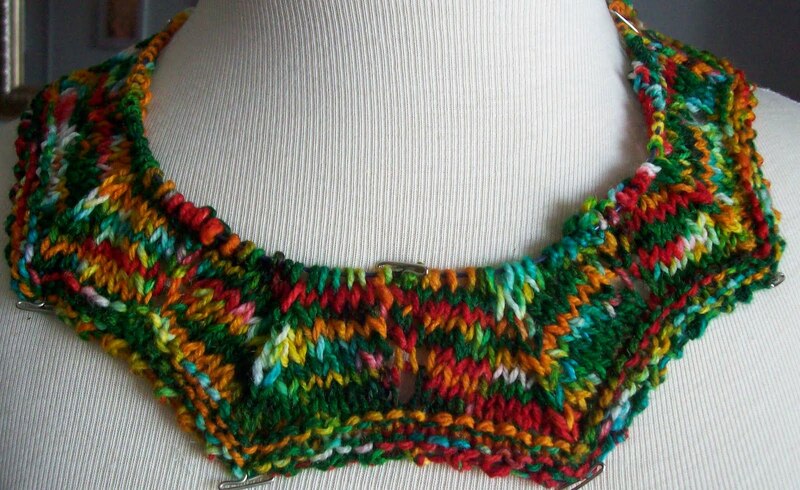 I think another 4 (or maybe more) inches of ribbing are needed. 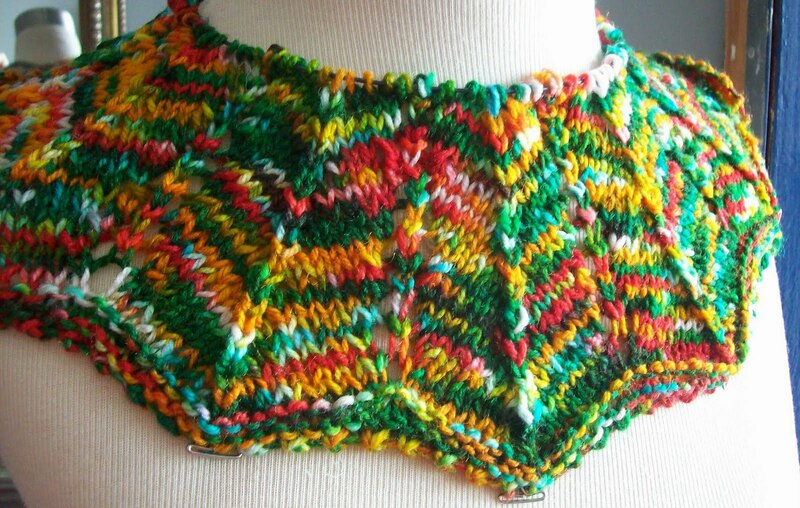 I'll write up the patten—but you'll have to take your chances and space dye a skein on your own, or find something similar or comparable –since this was just a skein of DK that I played with-- to end up with this result. The dye stuff was food coloring—but I think the pres-soak with alum effect the dye take up. There was no orange dye—just yellow—but it ended up intense –and orangey—and at other times, muted (there are some lovely shades of yellow ocher) Where the plain red overlapped the green—there is a deep rich plummy brown--(a puce really!) and I have no idea where the blue came from (and there are patches of blue) maybe at some points the green broke? I think am going to have left over yarn—and think there will be enough for cuffs on a pair of fingerless gloves. A happy set! And (finally!) cast on and worked a few rounds on the Garnets in Granite socks--no photo since Its not even a full (1.5 inches) of cuff. 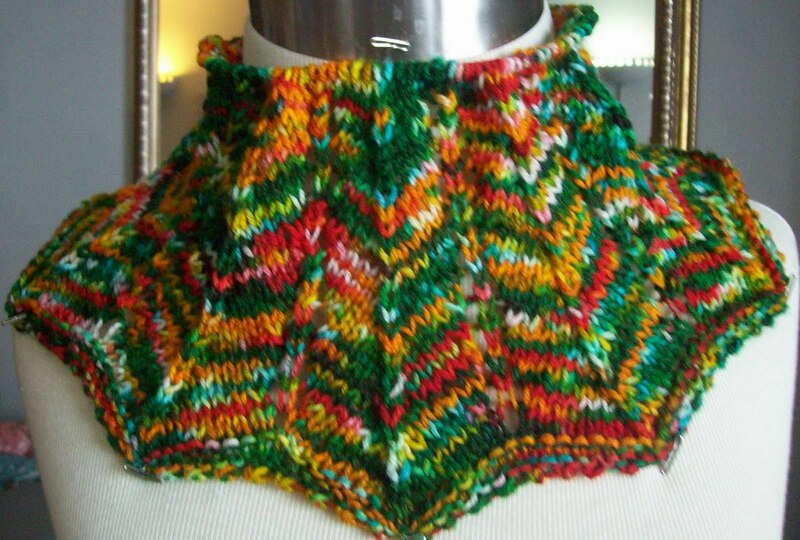 Those chevrons really make a wonderful-looking cowl, and show off the yarn well, too. Perfect matchup of yarn to use. Now you'll be looking forward to the end of summer so you can wear it!